Caron’s new photostability chambers meet ICH Q1B Option II’s cumulative visible and UV light exposure requirements in less than half the time of many competing chambers. Purpose-built for this test protocol, with tuned light banks and brilliant specular aluminum interiors, these chambers deliver greater and more uniform intensity to the target than any conventional converted temperature stability box. The large-format touchscreen controller makes setting up custom cycles simple, and clearly displays current operating conditions. Caron’s heated and heat/RH controlled chambers are ideal for many elevated temperature testing applications. With a range of ambient plus 10C to 70C, available controlled humidification, and tight performance tolerances, Caron’s chambers are ideal for long-term product, packaging, and materials testing, in fields from pharmaceutical to aviation. All units are easy to install, use, and maintain, and feature unique resource-responsible technologies. 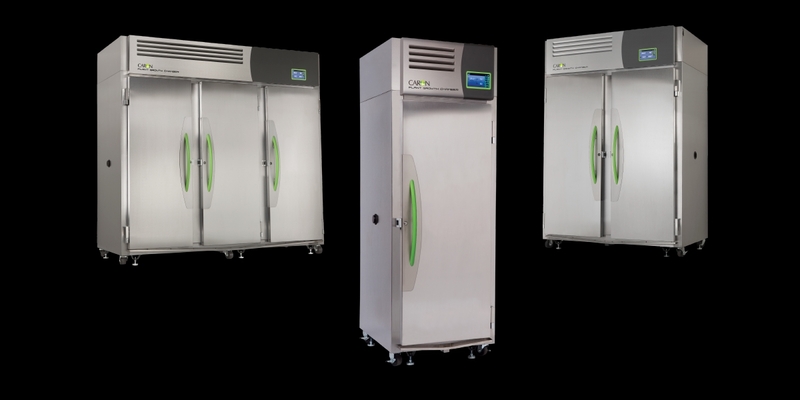 Caron’s refrigerated chambers are ideal for many testing applications. With a range of 5 to +70C (0C optional), tight performance tolerances, and a choice between capacities from 10 to 75 cu.ft, Caron’s chambers are ideal for long-term product, packaging, and materials testing, in fields from pharmaceutical to aviation. All units are easy to install, use, and maintain, with unique resource-responsible technologies. Caron’s freeze/thaw chambers are ideal for any application that requires temperature cycling down below freezing. With a range of -25 to +70C, Caron’s chambers are ideal for ASTM materials testing, as well as excursion testing for drugs, food & beverage, and personal care products. Caron’s uniquely easy touchscreen controls make all of these tests simple to set up, and easy to modify. Caron’s print chamber produces ninhydrin prints in 3 minutes, and DFO prints in 20, by combining precise temperature and humidity control. Microprocessor controls make this unit easy to use, and the 40C to 100C temperature and ambient to 80% RH ranges are suitable for all commonly used porous material test reagents. Caron also offers the Rapid Access Defense (RAD) series tactical storage system. Click here for literature, or contact Caron for more details.